Lucky me. Not only did I get to play with the Farrah Blouse and Dress pattern by the talented Chalk and Notch - I was also allowed to pick fabric from the one and only MissMatatabi for this tour project. This was actually my second pick. My first choice was a striped (linen) fabric, but MissMatatabi was almost out of that one, so instead I went with this light weight Kokka cotton voile. Is it wrong to say that I'm sort of happy that the stripes were sold out?! That's how pleased I am with this outcome. The Farrah and this fabric is a perfect match imo. - or at the front (view B). Both blouse and dress length include a hi-low hem with side seam slit. As you can see I opted for the blouse version and did some minor modifications to get the look I had in mind. The ruffles are so cleverly sandwiched between the front/back panels and an under arm gusset. Originally the beautiful ruffles just follow the curve of the design in all of their lengths but I wanted to be able to wear the blouse belted, so I had to move the ruffles up a bit or else they would get caught in the belt. In order to do so I simply gathered my ruffles and thereby shortening them prior to attaching. I really love the belted look but of course it can be worn without as well. I didn't make any other adjustments besides the ones already mentioned, so this is how it look on a 176-ish cm lady. With the coupon code 'trine' you can get your own copy of the Farrah pattern with a 15% discount this week. I know it's designed for woven fabrics but I might just have to make a ponte version as well. I think the stable knits would be great for Farrah. And, if I had another 3 metres of this fabric I would definitely turn it into a kimono. The print is just so beautiful. 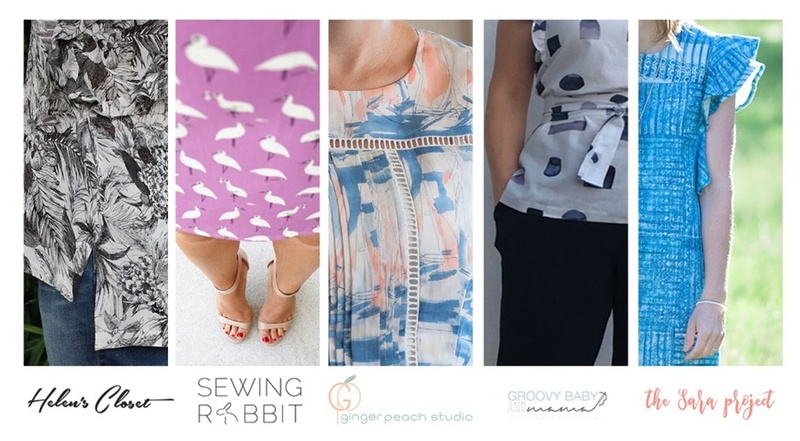 If you enter the Rafflecopter giveaway below you could be the lucky winner of a $50 gift certificate to my favorite Japanese fabric pusher MissMatatabi. Be sure to stop by the other amazing participants. I love what I've seen so far. Dear Gabriela/Chalk and Notch, Leslie/ThreadBear Garments and Frances/MissMatatabi, thank you so much for organizing this tour and for inviting me to join. The kind of dress that you want to wear all the time. Comfy yet elegant. This is the perfect way to describe this one! The Lodo Dress is the latest release from the talented Kelly of True Bias. Cap sleeves, two lengths to choose from, slightly cocoon shaped (you had me at cocoon shaped) and a little slit at the centre back if you fancy the longer version. Three pieces of fabric - and a very clever finish with woven facings on neckline and armscyes. Yes, woven finish on a knit dress. And it works very well. Very clean and no bulk. You genius, Kelly. This long version is sewn in a medium weight scuba knit. I'm definetely making a ponte Lodo as well. These stable knits are perfect for this design I think. The shorter dress is a must have for summer. So, summer. Please come. For real. Me: 'Look at my lovely new dress. Me: 'Why are you doing that smiling with sound thing? Don't you like it? Well, this giant poo still loves her dress. Kelly has a great sewalong for the Lodo on her blog. A clever and beginner friendly pattern. Beautifully shaped dress with a brillant, clean finish. A dress that can be worn with sneakers or heels. Perfection. A little stroke of genius. Mrs. Schrøder, the Summer Poo.